The Smithfield district of London is famed for its meat market, its architecture, and its rich history as a centerpiece for conflict — often surrounding religion but sometimes focused on football. It’s also one of the most underrated neighborhoods of London. For anyone interested in London’s macabre past, Smithfield delivers in droves. Apart from the bloody meat market, Smithfield offers everything from famous execution sites to haunted buildings, as well as some of the best preserved historic buildings in the city. Because Smithfield is more of a business center today, there are hardly ever any tourists checking out these interesting sites. However, due to the Crossrail developments and redevelopment of Smithfield Meat Market, the area is undergoing change and may not stay secret for long. For now, use its under-the-radar status to your advantage, and get to know one of the last vestiges of old London. Visit the historic, once dangerous, Cloth Fair street. The area around Smithfield is crisscrossed by narrow alleyways and streets, all of which have a story to tell. In Cloth Fair, one of London’s oldest streets, medieval traders gathered to sell material during the historic Bartholomew Fair, one of the city’s preeminent charter fairs. If you aren’t up on the lingo of the Middle Ages, a charter fair is a dressed up street market originally established by the British Royal Charter. 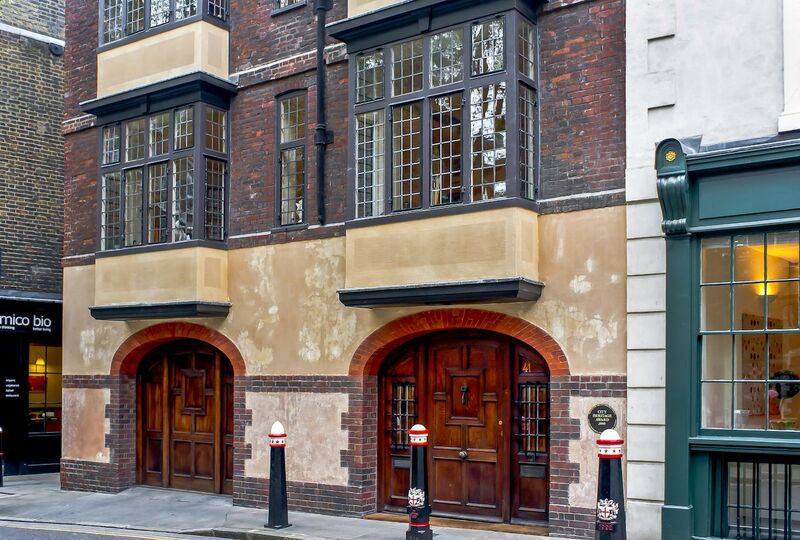 Later, Huguenot weavers worked in the tightly packed buildings, and the poet Sir John Betjeman even lived in the area at number 43 Cloth Fair, which you can see marked with a blue plaque on your visit. As you pass by you’ll notice a quirky window on the building, called The Sailor’s Homecoming and built in the Trompe D’Oeil fashion — meaning its design is made to appear three dimensional, though it won’t actually jump out at you. But the street also has a dark side. In the early 19th century, the Rising Sun Pub was used by body snatchers, thieves guilty of exactly what the name suggests. Surgeons from the adjacent hospital needed bodies for dissection, and as such a lucrative trade went on here. Hit the Smithfield Meat Market before the crack of dawn. 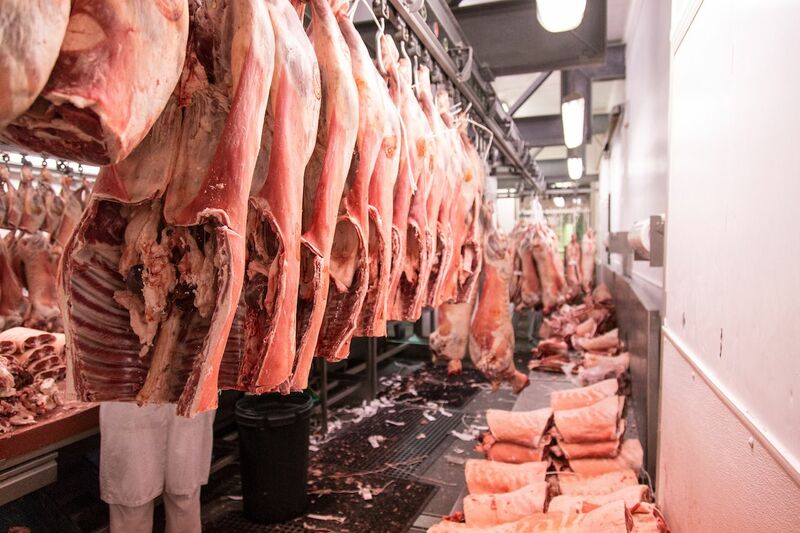 There’s a smell of sawdust around Smithfield Meat Market — the largest meat and poultry market in Europe. It’s a sight to behold, but be ready to wake up super early. The market is open from 2:00 AM on weekdays — you read that right — and closes once trading is done at 7:00 AM, which is also when many traders head off for breakfast in the neighboring streets. The Victorian building is a celebrated landmark in the area, and if you want to get in and snap some photos you’ll need to be there well before closing. Hope you love the smell of raw beef in the morning. Tuck into a local pub and former kangaroo court. Today, the cozy watering holes of Smithfield are perfect places to stop for a pint, but they’re not immune from a dark past either. 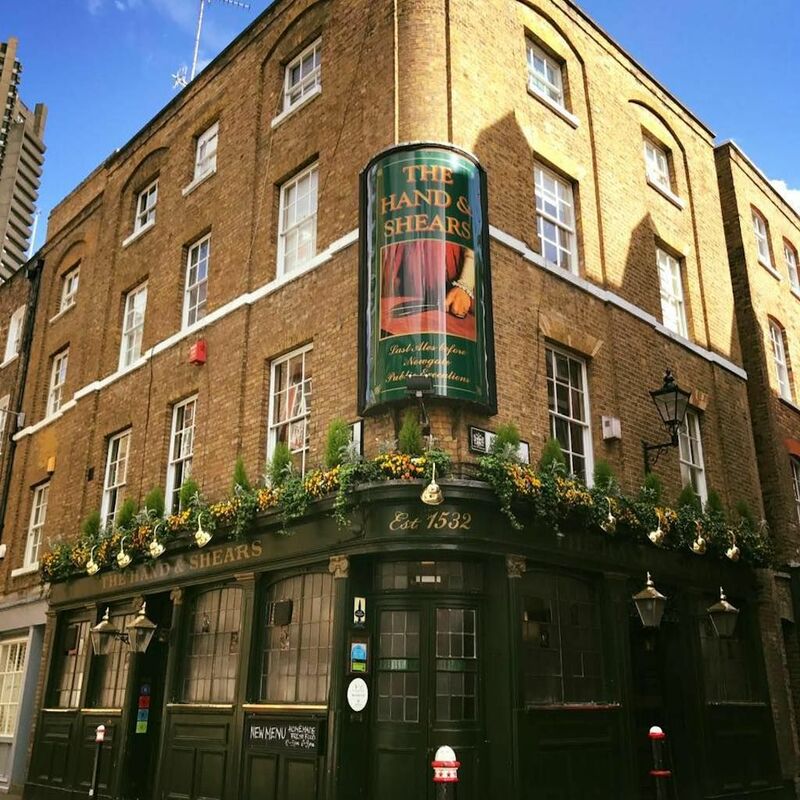 The quaint Hand and Shears dates back to the 1100s and is named for the cloth workers who would gather there before the St. Bartholomew’s Fair. Its upstairs is also believed to be the site where a temporary court would deliver swift justice to petty criminals, which, given its proximity to the fair and its unsavory characters, there were probably many of. The pub was also allegedly the spot of choice for revelers to enjoy a drink before a public hanging at nearby Newgate Prison — a popular form of entertainment back then. Indulge your Black Death curiosity at the Charterhouse. During the years of the Black Death, the area around Charterhouse Square was a plague pit. 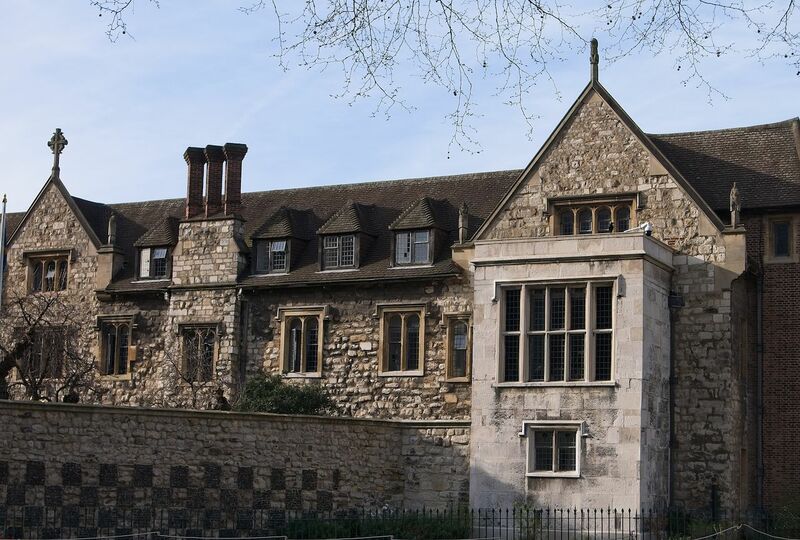 A monastery was built here in 1371, though during the Reformation years of the 16th and 17th centuries, this sanctuary was destroyed and the Charterhouse became a manor house where Lord North entertained Elizabeth I. Later, the building was a school, and the cloister is the place where soccer’s offside rule was defined. Today the Charterhouse is an almshouse for “men of good character,” and both the building and the museum are open to the public. Within the museum is a 14th-century skeleton of a plague victim, excavated locally. You can book a tour either with a professional guide or with one of the onsite men of good character, who will give an insider’s look into life in this historic building. These are highly recommended and are best booked online in advance. 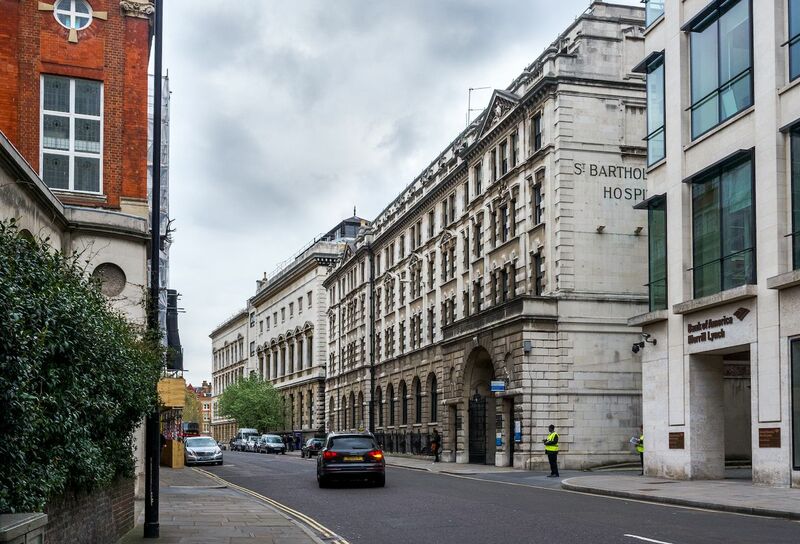 One of the most defining buildings in Smithfield is St. Bartholomew’s Hospital. This is the oldest one in England and dates back to 1123. The famous gatehouse has the only statue of Henry VIII in London and there’s a small museum just inside the gate which is free. It contains a tribute to Sir Arthur Conan Doyle who wrote some of his Sherlock Holmes stories when studying medicine here. There’s also the small parish church of St. Bartholomew the Less within the grounds. The hospital facade itself opens out onto a magnificent square with blocks designed by James Gibbs and a massive fountain as the centerpiece. This is the hospital where William Harvey first discovered the circulation of the blood, and has been at the forefront of many pioneering medical developments in its almost 900-year history. Speaking of Holmes, the hospital was also the filming location for the most harrowing and critically-acclaimed episode of the BBC’s Sherlock, “The Reichenbach Fall.” Spoiler alert: the hospital’s roof is where the final showdown between Moriarty and Sherlock takes place, where both characters fall to their deaths — one more permanent than the other. Commemorate one of history’s most infamous executions. While today there’s just a parking lot and a park, the walls outside of St. Bartholomew’s Hospital give a clue to the somber history of this area. In medieval times this was a place of jousting, fairs, and public executions. William Wallace, who fought for Scottish independence, was executed here in 1305. If you’ve seen Braveheart, you know that he was brutally hanged, drawn, and quartered (the actual execution was in fact way more gruesome, so he probably was unable to defiantly shout “freedom” or even given the opportunity to negotiate a quicker death). There’s a memorial to Wallace on the wall of the hospital. Alongside it is a plaque in memory of the many Catholic martyrs who were burned at the stake at Smithfield in 1546, during Henry VIII’s break with Catholicism. Even today, the area is reputed to be haunted after dark. Across the road, there’s also the historic church of St. Bartholomew the Great, which has been featured on the big screen many times. 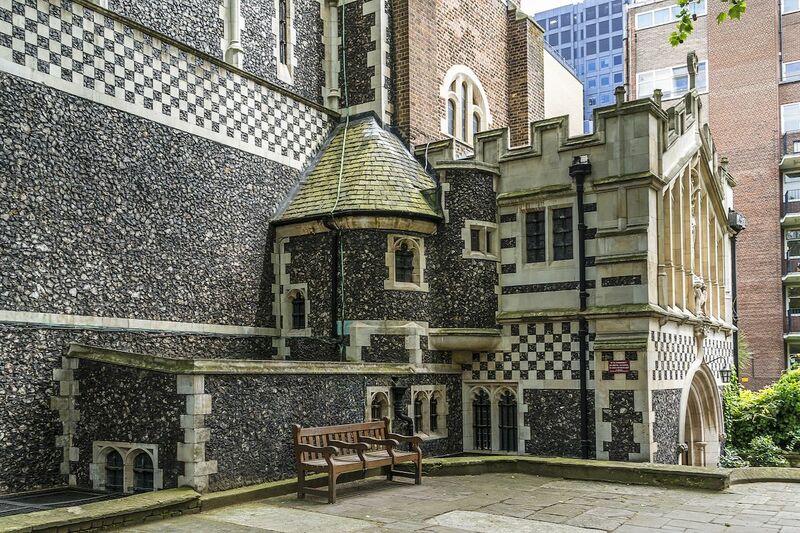 Rahere, an Anglo-Norman monk beloved by King Henry I, founded an Augustinian priory here in 1123 along with the famous St. Bartholomew’s Hospital. Today, it has one of the best surviving Norman interiors in London and is a very atmospheric church, which can be entered through a timbered Tudor frontage. In the Lady Chapel, Benjamin Franklin once worked as a printer. Rahere’s tomb is also within the church. Quietly reflect at Postman’s Park. Make your way down King Edward Street and you’ll come to Postman’s Park. This tranquil setting contains something very special — the Memorial to Heroic Self-Sacrifice. 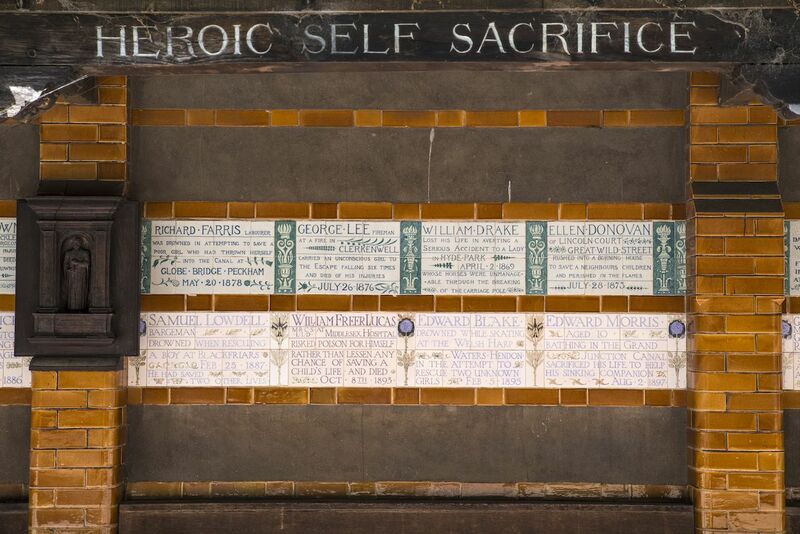 This is a public monument containing 54 plaques with the stories of ordinary people who gave their lives to save others. It is a peaceful, contemplative place within London that many tourists overlook. But this, like the other areas in Smithfield, is full of stories with a rich historical heritage.